Carissa Klopoushak (left) and Jacqueline Woods. A local chamber music festival created by two University of Saskatchewan alumni will celebrate its 10th anniversary in May. 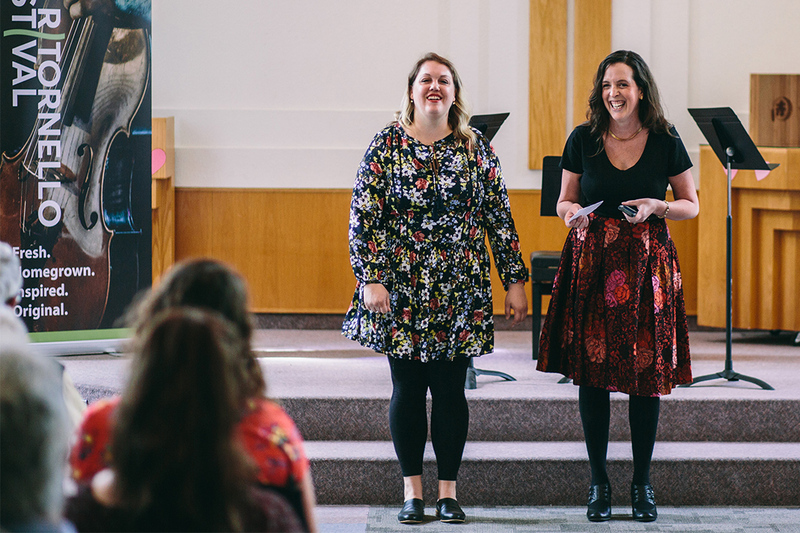 Violinist Carissa Klopoushak (BMus’04) and pianist Jacqueline Woods (BMus’06) co-founded Saskatoon’s Ritornello Chamber Music Festival in 2008 to bring the chamber music concert experience into the 21st century. Each spring, the two artistic directors showcase Canadian musicians who are currently pursuing professional careers across the country and around the globe. “We certainly are lucky to be part of such a vibrant arts community,” said Woods. “The festival does offer something unique from what’s presented in our city over the year. The programs are fresh and exciting, infused with the sort of festival adrenaline that comes with putting together pieces in such a short time frame. That feeling just can’t be duplicated,” she added, noting Ritornello offers performances in various spaces in the city and collaborates with spoken word artists, pop musicians and other creative people. “This means there’s something for everyone, and that there’s something in there that will speak to an audience’s heart or stretch a person’s mind,” she said. The 2018 Ritornello Chamber Music Festival will be held from May 25-27, 2018. It will feature three shows, including a concert at Convocation Hall on the U of S campus on May 25 at 7:30 pm, a show at Village Guitar & Amp on May 26 at 8:30 pm and the 10th anniversary celebration performance, scheduled for May 27 at 2:30 pm at Remai Modern. Although their musical careers have taken them around the world, both Woods and Klopoushak grew up in Saskatchewan and have never forgotten their roots. They look back on their days as undergraduate students in the College of Arts and Science with fondness. “Being part of a smaller program meant opportunity, and a level of nurturing that built a great foundation for my future studies. The U of S music program is also academically challenging; I was more than well prepared for the research and writing of my next degrees, as well as for my work in communications,” said Woods. “My experience at the U of S was unique, because I was possibly the only string player at the university at the time. It meant I got every opportunity to play, which I’m grateful for,” Klopoushak added. After earning her bachelor’s degree, Woods went to the University of Ottawa for a master’s degree in music before pursuing doctoral studies at the State University of New York at Stony Brook. She is currently engaged in PhD studies in aboriginal economic development at the Johnson-Shoyama Graduate School of Public Policy on the U of S campus. Klopoushak earned a master’s degree and a doctorate in violin performance at McGill University, where her dissertation focused on the little-known violin repertoire by Ukrainian composers. She spent much of early 2014 performing with the Australian Chamber Orchestra before moving to Ottawa, where she is a member of Canada’s National Arts Centre Orchestra. Both Klopoushak and Woods have advice for current U of S students and fellow alumni. Article re-posted on 2-Apr-2019 4:26:36 PM .